The frozen sounds of Hessien (Tim Martin of Maps and Diagrams, Atlantis, Black Elk and Bluhm, and Charles Sage of y0t0 and The Rothko Chapel), might feel like another exploration through guitar loops and careful soundscapes, an exploration done dozens of times before, but through this common adventure of sound, Hessien has actually found something. The dreamy waves of music on Calcifer have real dream like features in them, as if they manage to turn the listeners’ grasp on reality a little, just a little loose. The soft drone on the opening track brings both peace of mind and paralyzing nausea, as the sounds vibrate through the mind. The four tracks offer four different stories, yes, but these stories weld together into one narrative that is phasing in and out of comprehension, as the album plays repeatedly through my speakers. Post rock has this tendency of wanting to become sublime through the almost abstract music it serves. 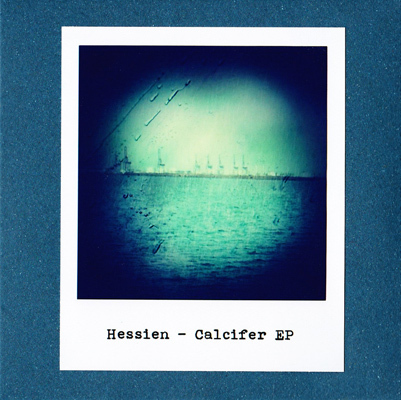 There are some bands or projects who actually came close to this, and Hessien is one of them.